For Introductory Meteorology Science Courses. This package includes MasteringMeteorology, an online homework, tutorial, and assessment product designed to improve results by helping your students quickly master meteorology concepts. Students benefit from self-paced coaching activities that feature immediate specific wrong-answer feedback and hints that emulate the office-hour experience to help keep students on track. With a wide range of interactive, engaging, and assignable activities, students are encouraged to actively learn, master, and retain tough course concepts. MasteringMeteorology should only be purchased when required by an instructor. Please be sure you have the correct ISBN and Course ID. Instructors, contact your Pearson representative for more information. NEW! Focus on the Environment and Societal Impacts feature covers weather hazards on people and society, not just looking at the physical principles, but also at the broader human issues, and mitigation policies and strategies. These case studies are grounded in real-world examples that illustrate the broad impacts on people and society and the decision-making that goes into coping with weather events. Focus on Aviation features examine meteorological challenges and impacts on aviation. Focus on Severe Weather features explore severe and hazardous weather phenomena. Special Interest features treat interesting topics related to the chapter themes, without interrupting the main narrative. Forecasting features describe how the principles discussed in the chapter can be used in forecasting, and often include simple “rules of thumb” that help students make their own forecasts. Did You Know? inserts throughout the book discuss interesting and unexpected facts. Physical Principles features provide optional mathematical explorations of key physical processes, and accommodate students who have a more quantitative interest in the topic. NEW! Emphasis on Oceans and their role in regulating weather and climate, including dedicated sections in Chapters 8, 15, and 16 on Oceans and Climate offering a unique coverage no other book has. NEW! The latest climate change science is integrated throughout, leveraging the findings of the IPCC 5th Assessment Report. NEW! The Seventh Edition is supported by Dire Predictions: Understanding Global Warming 2nd edition—an illustrated guide to the IPCC’s 5th Assessment Report. NEW! Reinforced fundamentals of the Scientific Method and Process in Chapter 1. NEW! Presentation and balance of math/equations including Physical Principles. UPDATED! Consistent pedagogy includes Learning Outcomes, Checkpoints, Summaries, Key Terms, Review Questions, Critical Thinking Questions, and Problems & Exercises. Big Picture part-opener spreads connect key concepts, visuals, learning goals, and media from the chapters. Learning Outcomes are integrated into the chapter-opening spreads to help students organize and prioritize their study of chapter content. Checkpoint in-line questions offer conceptual “speed bumps” or reading questions after major sections to help students make sure that they understand or can apply the material they’ve just read. NEW! Visual Analysis activities at the end of chapters draw on visualizations of real-world meteorology phenomena and data, asking students to make observations and predictions, and to demonstrate higher-level critical thinking and data analysis skills. Assessments also available in MasteringMeteorology. A pull-out Cloud Chart in the back of book offers students a quick reference to cloud types and their significance. World meteorology reference maps are presented on the inside front and back..
MapMaster™ interactive maps are inspired by GIS and allow students to layer various thematic maps to analyze spatial patterns and data at regional and global scales. GeoTutor Activities coach students through the most challenging meteorology concepts with highly visual, data-rich, kinesthetic tasks. 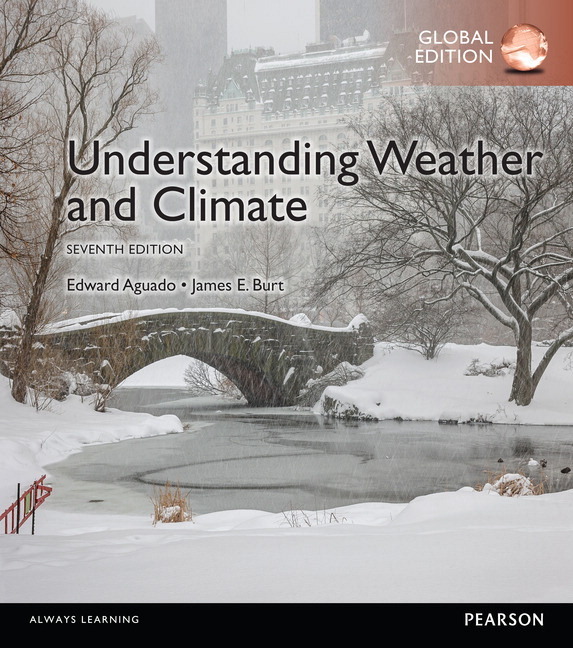 Carbone’s Exercises for Weather & Climate, Ninth Edition presents data-rich and hands on explorations of meteorological concepts for lab sections with problem solving, simulations, and guided thinking.